White Storks are large, wading birds. They are covered in white feathers, except for the black primary feathers on the wings; and have long, sharp bills and slender legs, both red. Males are larger than females, but both have identical plumage. Hatchlings and the young have black bills and yellowish-grey legs. 10% of the sale price of this neckwarmer is donated to the environmental NGO APNAE. For further information about the work carried out by APNAE, take a look to this page. What is the global population? The worldwide population is estimated to be between 500,000 and 520,000 individuals. They breed throughout Europe, North Africa, Asia Minor, and the Middle East. During the winter they migrate in flocks of thousands to tropical Africa, parts of the Middle East, and the Indian subcontinent. Thermal updrafts assist their migration. For this reason, they avoid stretches of open water, such as the Mediterranean Sea. White Storks love areas with shallow, still water that are neither too cold nor too humid. They avoid regions with vast tracts of tall or dense vegetation. So, they like areas similar to those preferred by humans for agriculture. During the breeding season, Ciconia ciconia seeks out suitable structures for nest-building, such as tall trees, rooftops, chimneys, haystacks, pylons, telephone poles, or constructed nest towers. The nest is usually built some 30 metres above ground. With up to 2 m in diameter and 3 in depth, the nest of the White Stork is among the largest of all birds. Sticks, branches, rags, paper, and other available materials are used for its construction. Ciconia ciconia, from the age of 3 or 4, remains in a lifelong monogamous mating pair. In spring, males return to breeding grounds, arriving a few days before females and immediately busy themselves enlarging the nest used the previous year. Females, on arrival, also participate in the nest-building. They nest in loose colonies of up to 30 pairs. The male, when rejoined by the female, carries out the “head-shaking crouch” display. First, he lowers himself into the nest in an incubating posture. Then, stretching out his long neck, he begins to shake his head from side to side. Finally, the couple cement their pair bond with an “up-down” display, in which heads are pumped up and down with wings outstretched, accompanied by the clattering of bills. Females lay 3 to 5 eggs (normally 4), which hatch after roughly 1 month. 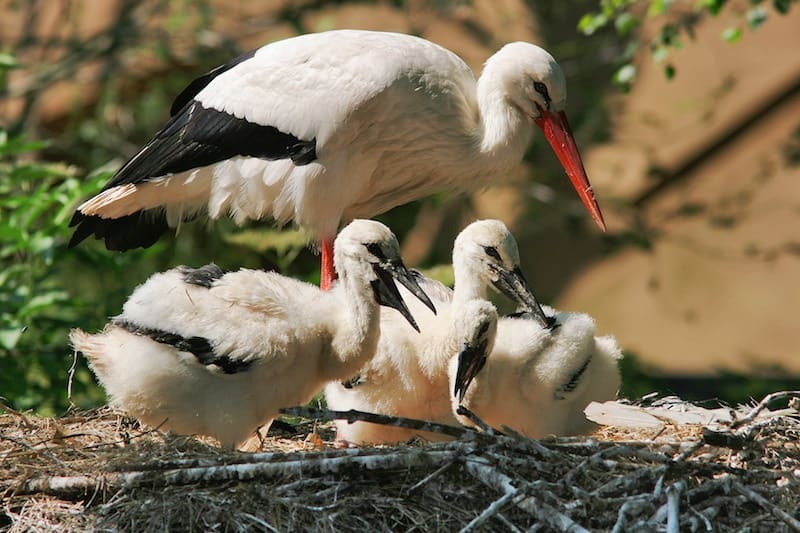 Within 8 weeks young White Storks may leave their nesting grounds and become independent. Ciconia ciconia feeds by day. It is carnivorous and has a varied diet of small mammals, large insects, amphibians, snakes, lizards, earthworms, fish, eggs and hatchlings of ground-nesting birds, molluscs, and crustaceans. In years of drought White Storks eat mainly insects and mice. In wet years their diet consists principally of aquatic animals. White Storks search for food while walking with their bill pointing towards the ground. When prey is detected, they jab forward their bill in order to grab it. Adult Ciconia ciconia has few predators, but nestlings and fledglings may be prey to hawks and eagles. Nests are placed high to protect eggs and young from terrestrial predators. Average lifespan in the wild: 22 years. Average lifespan in captivity: 35 years. 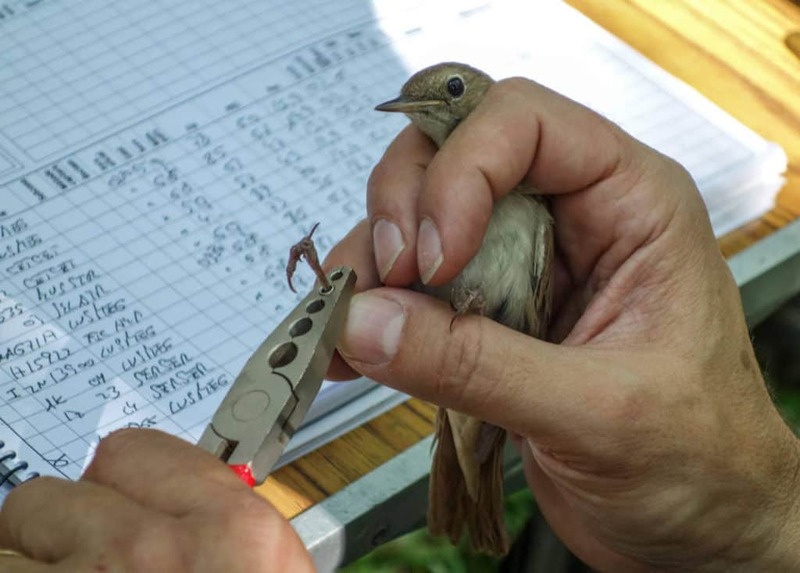 The breeding population of Ciconia ciconia declined during most of the 20th century, largely due to the destruction of suitable feeding habitats as a result of intensified agricultural development. 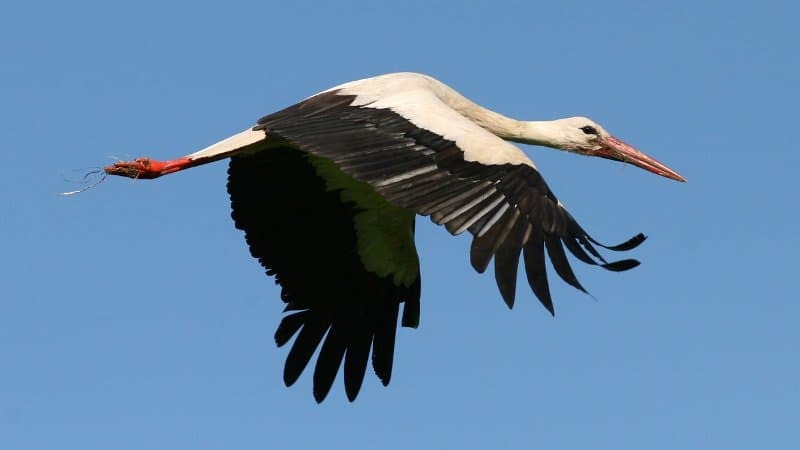 However, in recent years, the population of White Storks has recovered by as much as 20% thanks to new land-use policies, particularly in Spain and eastern European countries. Shortage of nesting sites in some areas. Nests destroyed during maintenance work. Changes in feeding conditions as a result of drought, desertification, and control of locust populations by insecticides (in Africa). Electrocution from overhead power lines. Evaluated by the IUCN Red List of Threatened Species as Least Concern (2015). Parents feed their young with regurgitated food every hour until hatchlings are 10 days old, and then every 2 hours until they are 15 days old. They usually defecate on their legs to regulate the body temperature in hot climates. For this reason it is not recommended to fit them with leg-rings for tracking purposes. It is said that 1 in every 4 White Storks is ‘Polish’. This is because Poland takes in about 25% of the nearly 325,000 White Storks that breed in Europe. There are records of individual nests being used every year for 100 years. 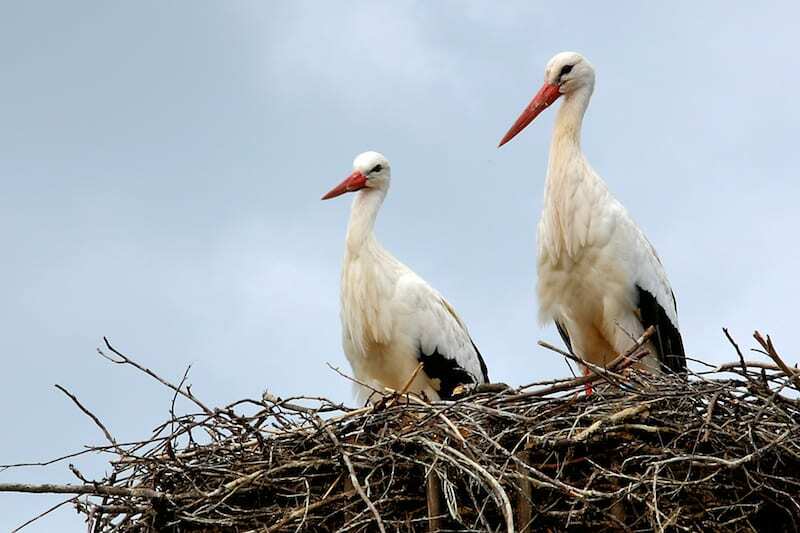 In some cultures the presence of the White Stork nests is seen as a sign of good luck, while in other cultures its arrival once heralded the arrival of a new baby. Ciconia ciconia is the official bird of Lithuania and is part of the symbol for the city of The Hague (Netherlands).